If you are looking for a tasty breakfast recipe that is full of flavor but low on calories, this egg white quiche is a winner. This crustless quiche is so colorful and hearty and is just brimming over with taste. It’s a great healthy twist on the traditional breakfast option. I’m a quiche lady. I love the combination of eggs and fresh veggies cooked in a pastry crust – especially when I have grown those vegetables myself! But cooking a quiche the normal way means that there are lots of calories and fat which I don’t want. This delicious crustless quiche combines lots of vegetables with just egg whites to give you a breakfast option that is lower in calories and much more healthy. And best of all, since it has no crust, it makes the recipe gluten free, as well! 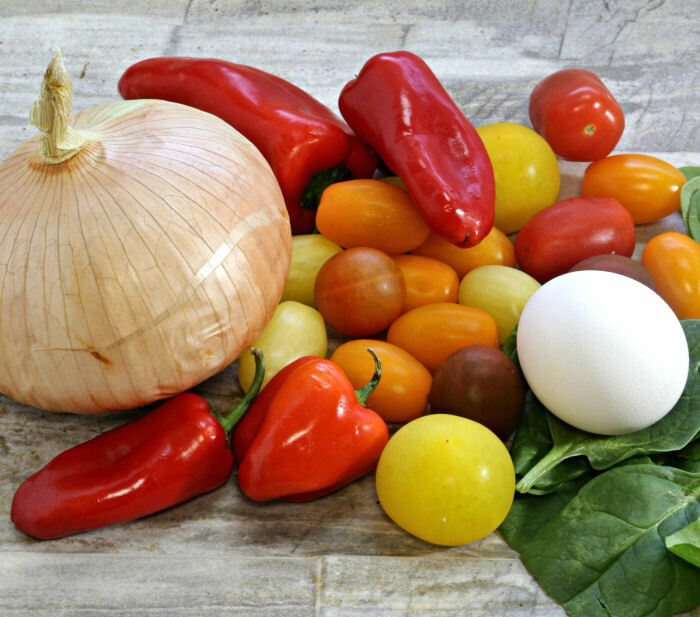 One only has to look at the vegetables that are going into this recipe to know what a feast this healthy crustless quiche recipe will be for your eyes. Baby spinach, roasted red peppers and colorful gourmet cherry tomatoes add both a hearty bite and so much color. Roasting the red peppers brings out the natural sweetness and adds this lovely flavor as well as color to the quiche. See my tutorial for other ways to roast red peppers here. Cook the onion and garlic in a pan that has been sprayed with Pam until the onion is tender. I let the onions caramelize a little to give them some color, but be sure not to cook them too long or the garlic will burn. While the onions are cooking, steam the spinach in the microwave and squeeze out the moisture so the quiche will not be watery. Beat together the egg whites, milk and cheese and then stir in the cooked onion and garlic. I chose a Gruyere cheese because it is so full of flavor and adds a great taste to this spinach and egg quiche. I added some fresh herbs now. Pretty much every recipe that I make has them in it. Herbs are super easy to grow and add so much flavor. 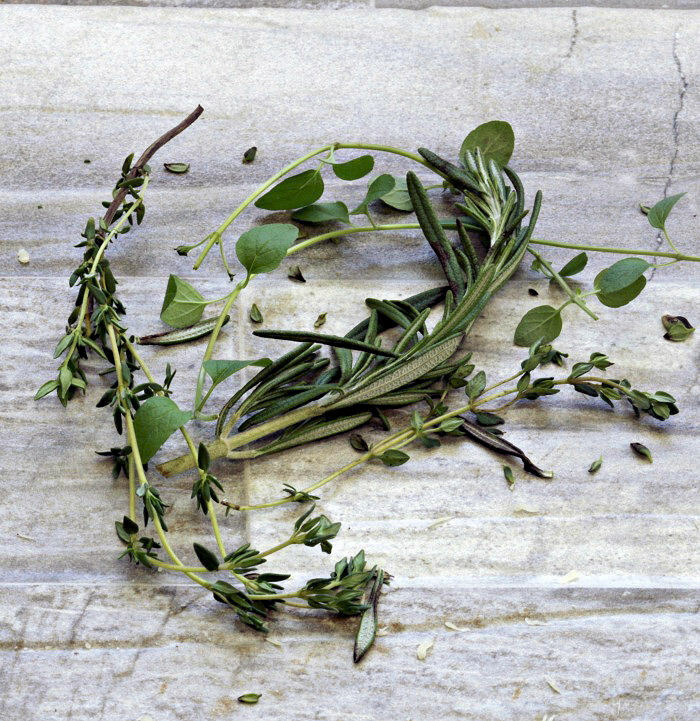 I chose rosemary, oregano and thyme today. 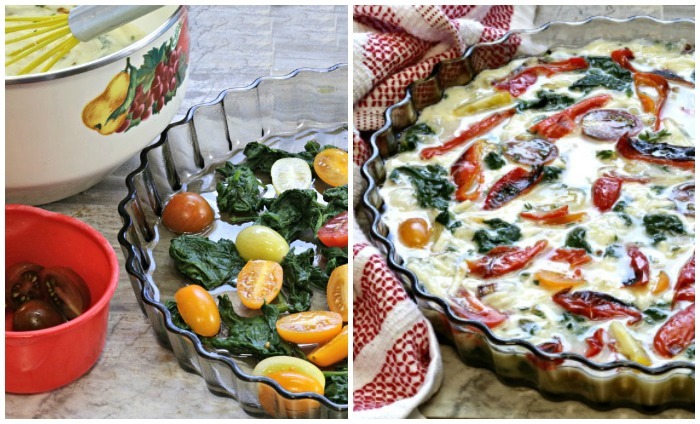 Layer the spinach and cherry tomatoes in a prepared quiche pan. taking care to arrange the layers to make the most of the color. Pour the egg mixture over the layers carefully. I put most of the tomatoes and spinach on the bottom layer, added the eggs and then layered over a few more pieces of spinach, some tomatoes and the red peppers. I love the way the yellow tomatoes adds some “yolk color” even though the quiche is made only from egg whites! This tasty quiche recipe gets cooked for 50-55 minutes. A knife inserted in the center will come out clean when it has cooked long enough. Let it sit for about 15 minute before you try to cut it. Cooking Tip: The smaller the diameter of your quiche pan, the thicker your finished quiche will be. This delicious breakfast quiche has a light texture but so much flavor from the Gruyere cheese and vegetables. It has a hearty taste and is creamy and delicious. The quiche sets well and looks so pretty on a plate. I love the taste of this recipe so much that I make it often. It makes a wonderful breakfast idea but is also really nice for lunch too! Feel free to play around with the vegetables and choice of herbs. You can use squash, for a different color of vegetables. Mushrooms would work well and zucchini would, too. Switch out the spices for sage and chives. If you want a bit more protein add in some cooked bacon. Whatever vegetable or herb you happen to have on hand in your crisper drawer right now will probably work just fine. The egg and spinach quiche recipe serves 8 at just over 100 calories each! Most of the calories in a quiche from the eggs, and it’s the egg yolk, where all those calories lie. So using lots of egg whites gives you the volume your are looking for with a tasty egg flavor but with far less calories and fat. The fresh vegetables make it so tasty and nutritious and give it loads of color. What a great way to start your day! One of the most common questions that I get from readers is “how many egg whites equals 1 egg”? The short answer is to use two egg whites for each egg for a traditional serving. This makes an easy swap in terms of volume. If you are using a measuring cup, you’ll likely find that 8 egg whites are equal to 12 egg yolks, since they are both 1 cup. This depends on the size of eggs you use, though. Measuring gives the exact range. I just find it easier to swap them 2 for 1. 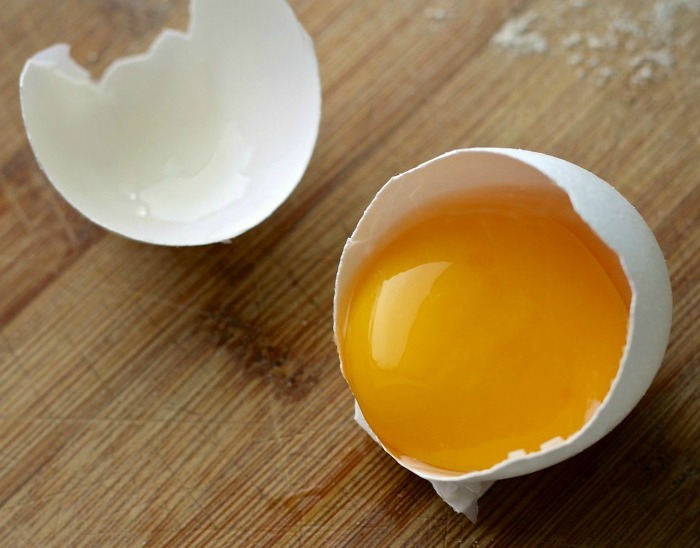 Replacing whole eggs with egg whites will give you less color, since pretty much all of the egg color comes from the yolk. This is why we use lots of colorful vegetables in this recipe. For the health conscious cook, one egg yolk contains close to 200 mg of cholesterol and is loaded with fat, so it makes sense to do the switch. Make some copycat Joe’s Crab Shack crab cakes with them. Moisturize your hair. Yes, it works! Eggs are rich in fat and protein and act as a natural moisturizer. 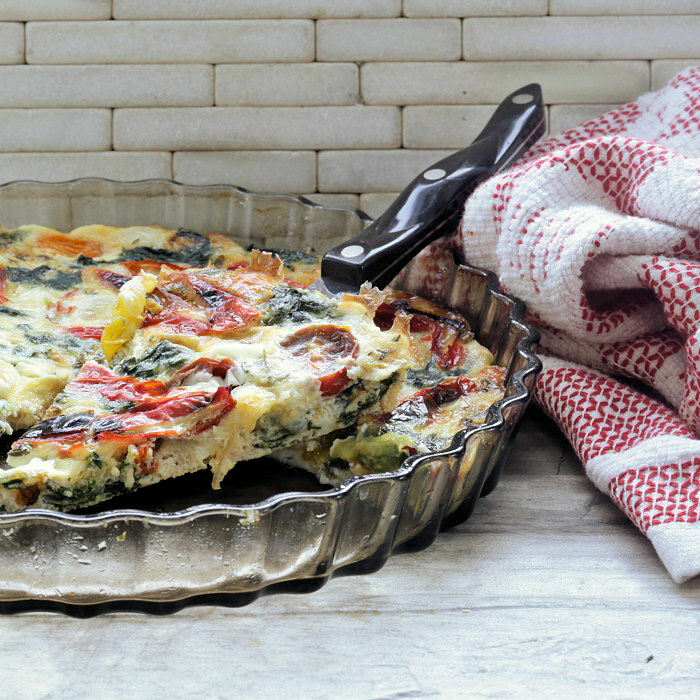 This delicious egg white spinach quiche has 101 calories in each serving. (I plan to have 2!). Heck, the whole quiche only has just over 800 calories. Compare that to a normal quiche with about 250 calories a slice and you can see why this dish is such a popular one on my blog. The recipe is low in carbs, sugar and cholesterol and has a decent amount of protein. It’s the perfect breakfast for anyone watching their weight who still wants a lot of flavor in the meal. With the time for roasting the peppers and allowing the quiche to cook and set, this recipe can take quite a while. It can be prepared the night before, or the peppers can be roasted the night before, and the quiche made the next morning. 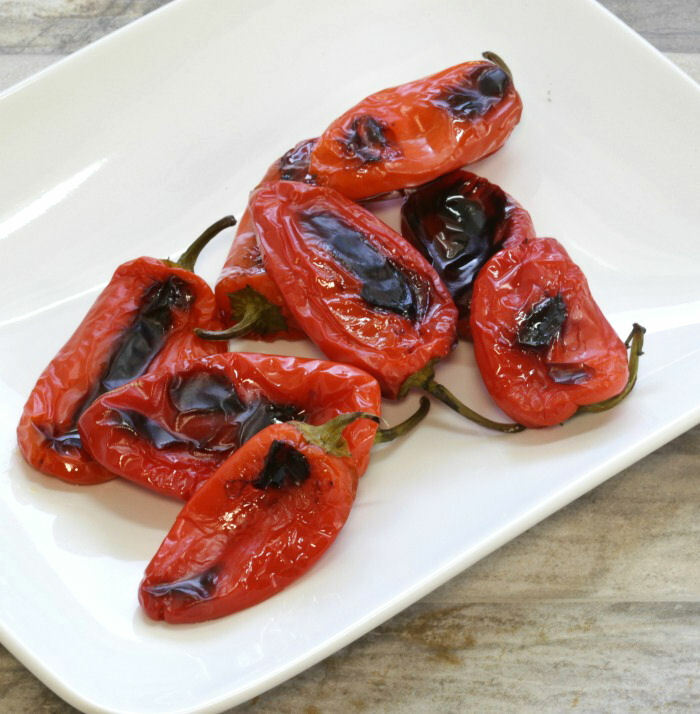 You can also char the peppers over a gas grill, or a gas stove to save time. Bottled roasted red peppers are available from most stores and can be used instead of fresh, but the flavor is not as good as those that are freshly roasted. Have you tried cooking with egg whites instead of whole eggs? What do you think of the end results? Admin note: This recipe first appeared on the blog in April of 2013. I have updated the post to include a step by step tutorial, added new photos, and have also added the nutritional information. 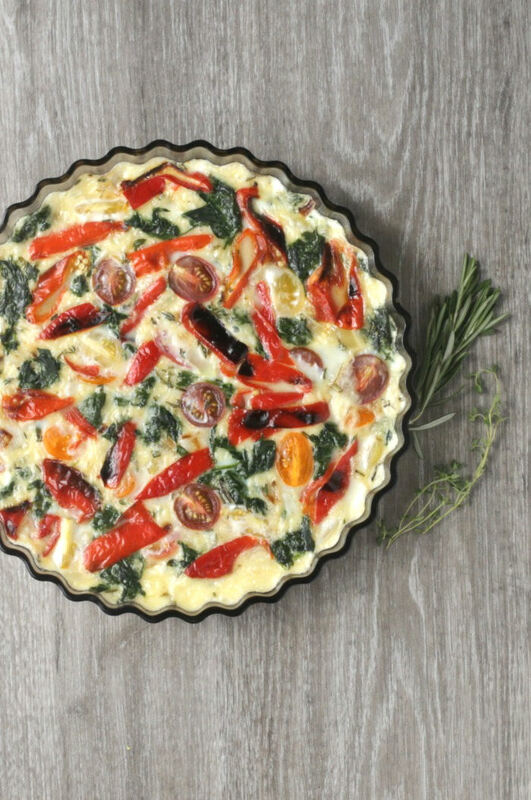 This egg white quiche recipe low in fat and cholesterol but loaded with flavor and color. It is gluten free and low carb and tastes amazing. Preheat oven to 350°. Spray an 8:inch quiche pan with Pam. Cook the onion and garlic in a pan sprayed with Pam for a few minutes until tender. 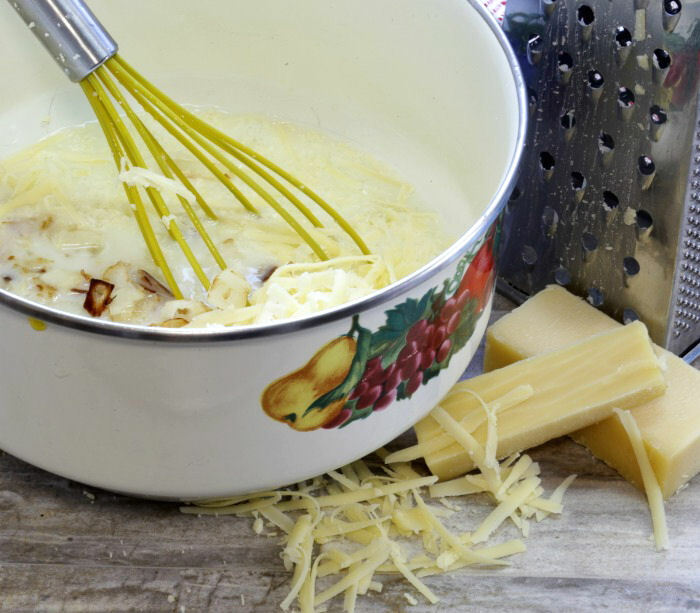 Beat together the egg Whites, milk and Gruyere cheese. Add the onion and garlic and fresh herbs. Season with salt and pepper. 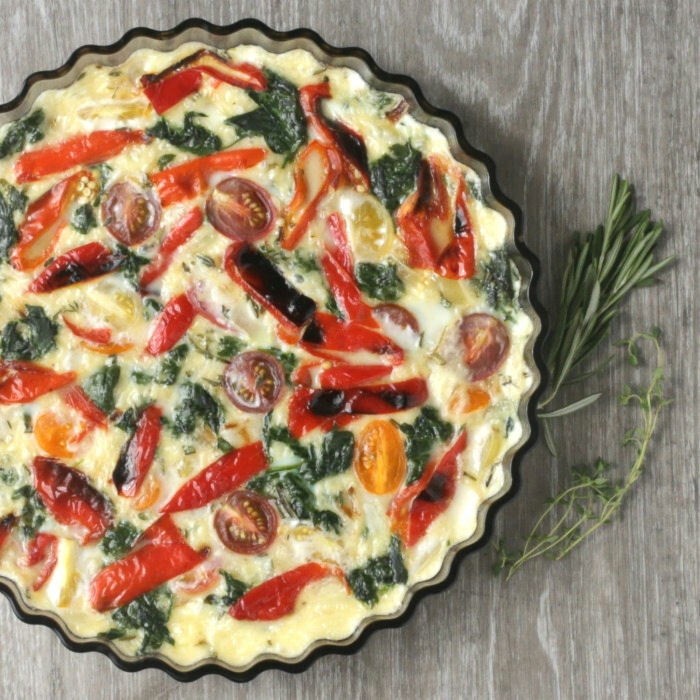 Layer the spinach, peppers and tomatoes in a sprayed deep dish glass pie plate or quiche pan, arranging top layer attractively. Carefully pour egg mixture over layers. Bake for 50 to 55 minutes until a knife inserted in center comes out clean. Let sit 15 minutes before cutting. My pleasure Revonda. Hope you enjoy it. Could you post some nutritional information for this recipe please? I’m love this recipe! One question though, when you say ‘reserve the yoke for baking later’ Did you mean it for this recipe or save them in general for another dish? Hi Jess. Just for another recipe. I hate to waste any food, so I always save, egg yolks or whites for later. This is delicious. I used 4 whole eggs, since I eat the yolks for the choline and vitamin D. When it comes out of the oven, it looks like it has a crust. It looks great too. It’s a very versatile recipe, so have fun trying different ingredients. I also tried broccoli and cheddar with tomato slices on top. Awesome. This looks delicious. I plan on making custard-based vanilla ice cream soon, so thank you for the inspiration of an egg white quiche!